Awesome UFO design allows you to hang it against a wall! Hey there. You can never have enough Bluetooth speakers. There are so many designs that you need to test them out to see which ones work best for you. I've had the privilege to try out small speakers, large speakers, pill looking speakers, and even take me hiking speakers... but I must say that my favorite so far has to be this M2R UFO Bluetooth Speaker. Our good friends provided me with this Bluetooth speaker to try out and review and it definitely is at the top of my list. Not only because of the shape, but because of the exceptional sound, booming bass, and... well... because it's a UFO! lol Before I fill you in on my experience, let's talk specs. great UFO designed Bluetooth Speaker! Now... let's start off with the design. The reason why I love the M2R UFO Bluetooth Speaker is because the design is near perfect. The UFO shape allows for the speakers to project the sound into the room as opposed to being projected in a single direction. Other speakers clearly have a front and and a backside and if the speakers are not pointing in your direction, you will not get a full sound. That is simply not the case with this Bluetooth speaker. You can set it practically anywhere and you will get a rich, full sound. Even if you do want the sound to project in a certain direction, you can hang it using the strap that comes with it. 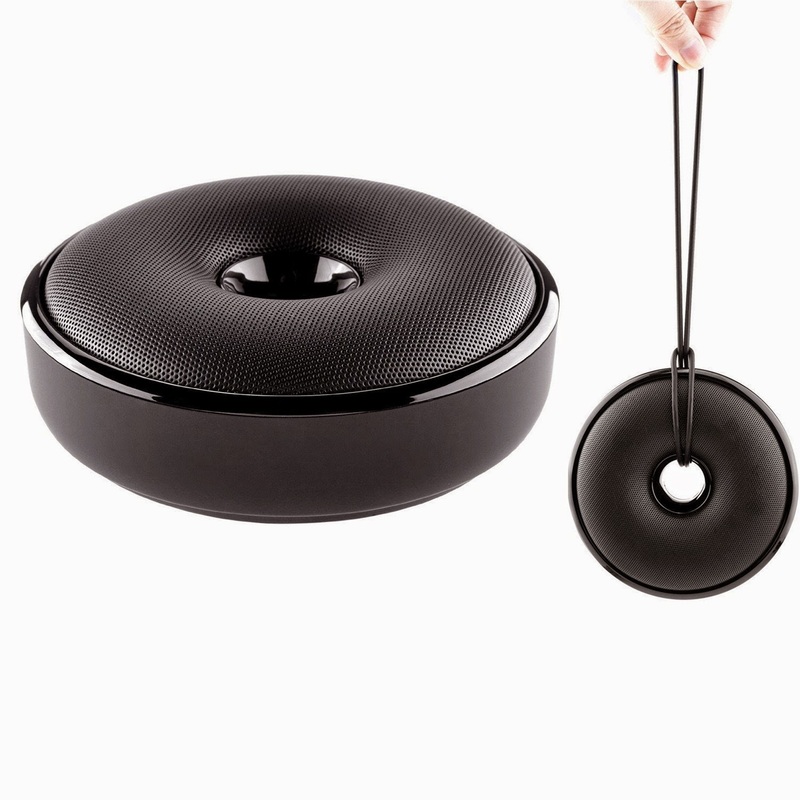 You can easy loop the strap, like in the first picture, to hang the UFO speaker and have sound blast in a single direction. Also, the soft rubber that outlines the bottom of the speaker is definitely soft to the touch and assures that it won't slide or bounce around when playing loudly. Also, the touch controls are a neat feature but it took some fumbling from me to get used to them. You have the standard, play/pause, plus and minus buttons. The touch buttons are under the speaker and I instinctively grabbed the speaker from the bottom and end up pushing some of the buttons by accident. It takes a few tries to train yourself to not touch those when lifting it up. The touch buttons are very responsive, even though they have the rubber coating around them. I also liked that the audio cable, the micro USB cable, and the TF card slots are hidden behind a strip of soft rubber. By doing this, the rubber coating on the underside of the UFO speaker keeps it looking inform and good. Big kudos on the design! As for connectivity... it was easy peasy. As soon as you turn on the M2R UFO Bluetooth Speaker, you are greeted with a voice that says, "Connect Bluetoof". Yeah, that's right... it says, "Bluetoof". I chuckled. I'm not going to lie. But I know what it was trying to say and in essence, the speaker is already in scan/pair mode so if it's your first time connecting, you'll need to manually pair up with the speaker on your device. If you have connected before, the speaker will automatically pair up for use after about 5 seconds or so. I thought this was great since it allowed me to pair up several devices and depending on which one I wanted to use, I would be able to connect simply by turning it on. And for the wire connections, it was just as easy. I have a Kindle Fire that does not have Bluetooth capabilities but I was still able to listen to Spotify from the speaker by using the wired connection. Big points for easy connectivity. The touch buttons don't even look like buttons. That's how awesome they are! Now, for functionality. As a music player, it is freakin' awesome. I love the sound. The bass is booming, the mids are clear, and the highs are crisp. It's exactly what I would expect from a high priced speaker but the M2R UFO Bluetooth Speaker gives me that high end sound at a relatively low price. It is now my go to speaker to pump out the jams while at home. Especially since it fills the room, nah... house, with sound. It's the perfect set up to fill the place with music while doing those weekend chores. I can turn volume up and down using the touch buttons on the speaker or through my device. Also, I would be able to pick up a phone call using the speaker and have a conversation through the speaker. But as I've mentioned before, this is a function that I would not use since I don't want the whole world to listen in my conversation. But... if you're into that kind of thing, know that this speaker can provide that for you. The last thing that Bluetooth speaker can do is tune in to FM radio. Now... this is the only function where the M2R UFO Bluetooth Speaker gets low marks. To enter FM Radio mode, you'll have to press and hold the play button. Once the speaker beeps, you'll be able to scan for stations. The speaker does not have a display, so you have no idea what FM station you are tuned into but in order to scan through the stations, you'll have to short press the play button. This can become frustrating when you realize that you'll end up with a lot of static stations since the speaker does not have an antenna to strengthen your FM signal. Even after you do find a station that you like, if you turn off the speaker, you'll have to start all over to find it. Having a FM radio function is nice, but it is not executed well. And lastly, not having a LED display also hurts the FM radio function. I'm an Pandora/Spotify person myself so I won't bother with the FM radio function so it's not going to be a deal breaker for me and if you are looking for a FM radio, you may want to look elsewhere. So there you have it. This is a strong Bluetooth speaker that you would be proud to have out and about in your home. Full, crisp sound fills any room where the M2R UFO Bluetooth Speaker is in. Many of these types of Bluetooth speakers easily go for over $100, but you can pick up this particular model for under $40 at Amazon! Don't get caught overpaying for a high quality Bluetooth speaker. Head on over to Amazon and pick up yours today! Later!